Figure 1. Ginger (right) and turmeric (left) plants in the greenhouse. All photos by University of Florida. Consumer interest in superfoods with high nutritional or health properties and the desire for locally grown and fresh produce provide a commercial opportunity for growers. Consider ginger and turmeric as a profitable option to diversify your operation. Ginger and turmeric are widely used in cooking for their flavor and color. They are also used in Asian medicine to relieve inflammation, improve joint health, reduce blood sugar, and combat disease. Such properties have been attributed to gingerol and curcumin compounds. Dried ginger and turmeric are used in food packaging, capsules, drinks, and tonics. Fresh rhizomes are sought-after items for smoothies and Asian cooking, and can obtain high prices of up to $20 per pound from farmers’ markets or high-end grocery stores. Nursery owners can sell live ginger and turmeric container plants in the spring to consumers who want to grow and harvest their own product. Ginger and turmeric (Figure 1, see slideshow) are in the Zingiberaceae family, and are ancient crops domesticated centuries ago. There are about 150 species of Zingiber or ginger — 34 of them from India and 24 from China — and edible ginger is Zingiber officinale. Edible turmeric is Curcuma longa, and C. amada (C. mangga) is also edible and tastes like green mango. Curcuma caesia (black turmeric) has attractive leaves with a dark, central vein, rhizomes with dark-blue centers, a camphoraceous sweet odor, and it is used as a traditional medicine. Cultivation. Ginger and turmeric are cultivated in tropical and subtropical areas, including India, China, Nigeria, Indonesia, Bangladesh, and Australia. Ginger grows in warm, humid climates and is cultivated from sea level to an altitude of 5,000 feet, while turmeric grows from 1,300 to 3,000 feet. Optimum growing temperatures are 68ºF to 77ºF, with low temperatures leading to dormancy. In warm areas, plants may require shade during the summer to avoid heat stress and foliar damage. Planting. To plant ginger or turmeric in the spring, cut rhizome fingers (referred to as seeds) to 2 to 3 inches with two to four buds. The cut areas should be surface sterilized with a 10% bleach solution, and then the seed pieces are dried. Because sprouting of buds can be uneven, maintain seed pieces in a humid potting mix under 80% humidity before planting. Alternatively, tissue culture plantlets are available, which provide uniform and pathogen-free planting material. However, the yield and quality of the first-year harvest from tissue culture is usually lower than when planting rhizome seed pieces. When planting containers, a well-aerated potting mix should be used, with components such as coarse coconut coir, peat, or bark. Tissue culture plantlets are planted at the crown, whereas seed pieces are planted about 2 inches below the surface. Enough empty space should be left at the top of the containers to allow for mounding of the plants twice, around 45 and 90 days after planting, which will help increase the rhizome size. Leaves can show tip burn if the substrate is not kept sufficiently moist, or if the fertilizer levels are either too low or too high. Photoperiod. Ginger and turmeric are quantitative short-day plants for flowering and rhizome swelling. They require long day photoperiod (≥12 hours) for continuous growth without entering into dormancy, and gradually reduced daylength (≤ 11 hours) for rhizome production (Figure 2, , see slideshow). Therefore, as the temperature gets colder and the days are shorter in the fall, leaves turn yellow and plants enter dormancy. At this point, irrigation can be stopped and after three weeks the wilted plant tops can be cut off. Harvesting. Three additional weeks may be allowed for rhizome drying before harvest. The harvest time after planting depends on the end use. Five months after planting is enough for rhizomes that will be sold as fresh vegetables, with low fiber and pungency, and with segments of green leaves attached. Rhizomes harvested between five and seven months after planting are suitable for curing and selling in retail, and for making preserves. Rhizomes with longer growing periods are more suitable to be dried or used to extract essential oils. After harvest, wash rhizomes with high-pressure water to remove the soil, and then treat with 10% bleach solution for disinfection. Rhizomes to be used for seed can also be treated with fungicides. Storage should be at a low temperature and high relative humidity (55ºF and 70%) to prevent drying, and any diseased rhizomes should be discarded. At the University of Florida (UF), we are evaluating different species and varieties of ginger and turmeric under two different photoperiods in the greenhouse (natural days, or long days by providing night interruption from 10 p.m. to 2 a.m.). In the first year of our trials, shoots kept growing through the winter under artificial long days, but photoperiod did not affect rhizome yield. 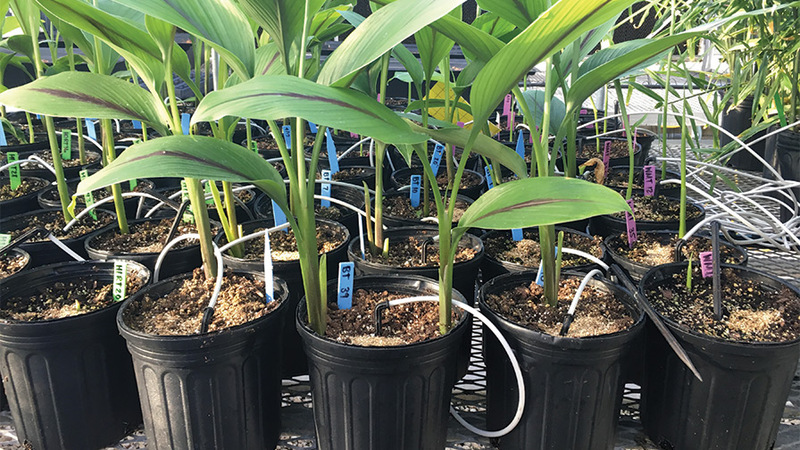 Turmeric grown from rhizomes in our greenhouse had a higher yield (2.2 pounds per plant) compared with first-year tissue culture plantlets (0.6 pounds per plant). For ginger, there were no significant differences in yield between plants started from rhizomes or tissue culture plantlets, and plants yielded on average 1.8 to 2.2 pounds per plant (Figure 3, , see slideshow). Large containers work best. We harvested only 0.8 pounds of rhizomes per plant of ‘Hawaiian Red’ turmeric in 2-gallon pots, whereas yields were 2.2 pounds per plant in 16-gallon pots. We are now starting our second year of research and evaluation of species and varieties for rhizome yield, as well as ornamental value as greenhouse or landscape plants. We are also aiming to obtain uniform sprouting of seed pieces by evaluating treatments such as a water soak and hormone treatments with different concentrations of ethephon or benzyladenine (Figure 4, , see slideshow). Additionally, we will run chemical analyses on the rhizomes, and research the profitability and marketing of rhizomes as local fresh food or for use in the beverage industry. Alternative crops such as ginger and turmeric provide niche alternatives that fit the consumer trend toward locally grown superfoods. Consider producing live or processed plants at your operation. The authors would like to thank their industry partners in the Floriculture Research Alliance for their support. This material is also supported by the National Institute of Food and Agriculture, U.S. Department of Agriculture, “Resource Efficiency in the Floriculture Production and Value Chain”, #3607-21000-015-38S. Thanks also to AgriStarts, hawaiianorganicginger.com, and justgingerfl.com for supplying plant materials. Sofia Flores ([email protected]) is a M.S. student in the Environmental Horticulture Department at the University of Florida. See all author stories here. Rosanna Freyre ([email protected]) is a Research Scientist in the Environmental Horticulture Department at the University of Florida. See all author stories here. 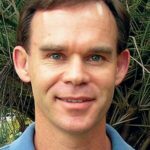 Paul Fisher is a Professor and Extension Specialist in the Environmental Horticulture Department at the University of Florida. You can eMail him at [email protected] See all author stories here. And they are so fun to grow and harvest! I grow turmeric and an inedible flowering cone ginger at my house. Ornamentals are still fun to grow even though you can’t eat them.